I do love the simplicity of the Bible. It's not that the message is simplistic as in stupid or not thoroughly thought out but it is simple. The blog I posted yesterday had a lot of detail about the gospel, the authenticity of the message and provided some examples of people who made it their aim to verify and/or discredit the Bible and Christianity. Today's blog will be different. All I want to do is restate how a person becomes a Christian and can be sure of the safety that is guaranteed in the word of God, the Bible. Please read the verse above carefully. It is plucked out of Acts chapter two in the Bible. The Apostle Peter is the preacher. He is explaining events that had just taken place in Jerusalem. People in the city had assumed that the disciples of Jesus were drunk (see verse 15) because they had been given, by God, the ability to talk languages that they had never studied or learned (see verse 6). Peter announced that this amazing phenomena was the fulfilment of an ancient prediction. The prophet Joel had prophesied that this would happen, Joel 2:28-32. It was a prediction that some day in the future God would 'pour out His Spirit upon all flesh' and that young and old would speak God's message to the society around about them. The day of it's fulfilment had arrived and the people of Jerusalem were witnessing it first hand. These were extremely significant and momentous days. But what was the point of this miraculous outpouring of God's Spirit on men and women in Jerusalem. Was it just a spectacular event or would there be a long term effect on people. Peter gives us the answer in this verse! The purpose was to catch people's attention! God was speaking and he wanted people to listen. Often when God speaks most of us ignore Him. Sometimes God has to shake us up a bit to get our attention! Maybe he has done that in your life. Could it be that it took illness to catch your attention! Or relationship problems! Or financial difficulties! Whatever it takes God will not be ignored, the matter of your soul and your eternal destiny is far too important! You may drift along but at some stage in life God requires you to listen to his voice. It's for your eternal blessing and well being. The event we are readng about today was the day that the Church was formed. Christians call it the birthday of the church. The Bible calls it the 'Feast of Pentecost,' Leviticus 23:15,16 & Acts 2:1, which was an ancient Jewish festival that took place at the end of a harvest period - it was also known as the 'Feast of Ingathering,' Exodus 23:16 & Exodus 34:22. 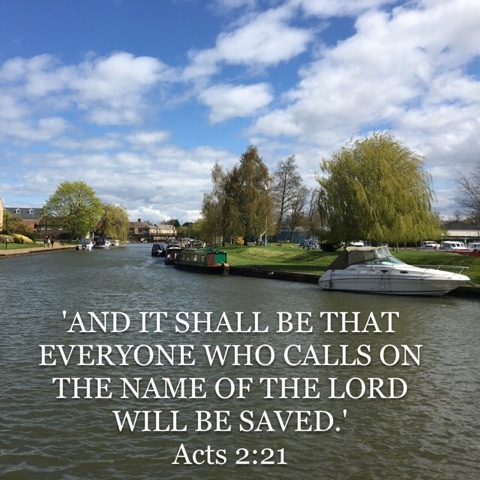 It is a wonderful picture of the fact that God is gathering out of the world people who are prepared to repent (turn from) their sins and trust His Son for salvation. Three thousand people were saved on the day that the Church was formed and another five thousand men were saved a few days later. It was definitely a Feast of Ingathering. People were accepting God's forgiveness through trusting Jesus Christ as Lord and Saviour. A. You need to ask God for forgiveness for Him to save you. You need to realise and admit you need salvation before you will do that! In other words if you don't realise you have sinned against God then you won't ask. Sin is every wrong thing you do, think and say. It is arge and small offences. It can take the form of lies, selfish behaviour, unbelief, stealing in any shape or form, anger and sexual sin any shape or form. This is just a very short sample list, ultimately sin is to fall short of the glory of God; that is God's standards which are glorious and for our blessing. B. You need to realise that the Lord Jesus is the only one who can save you! If you don't 'get it' about who Jesus is you won't accept that He alone can save you. He was not just human; he was God who became a man. He demonstrated by miracles that he was God visiting earth. He is perfect and never sinned or did wrong. It is his perfection that qualified him to take the punishment for our sins. This is why he is the only one who can save.....because no one else is without sin. C. Finally, you need to accept that Jesus came back from the dead. Read my blog posting of the 22nd April 2016 to get more info re this. It is a key ingredient of the gospel message - 1 Corinthians 15 & Romans 4:25. If Jesus is still dead the Christian gospel is a farce. My prayer is that you will come to God by faith in Jesus and know the joy of salvation and peace with God. Please get in touch through my web-page www.seekthetruth.org.uk.